The Scots are a tenacious bunch; and their history is a pungent mix of romance and tragedy. Legendary characters like William Wallace – who – single-handed – raised a fearsome Highland revolt – muscled up against the English invaders, time and time again. Wallace, with Andrew Moray gave a well-trained and drilled English army a drubbing at the Battle of Stirling Bridge in September 1297. However, Wallace, by then Guardian of Scotland, suffered an ignominious defeat in July 1298 at the Battle of Falkirk. Disunity was Wallace’s undoing: his Norman cavalry did a bunk as the battle began; the hero escaping by the skin of his teeth. Seven years later, and the Scots’ great defender was in English chains awaiting a fate worse than simple death. 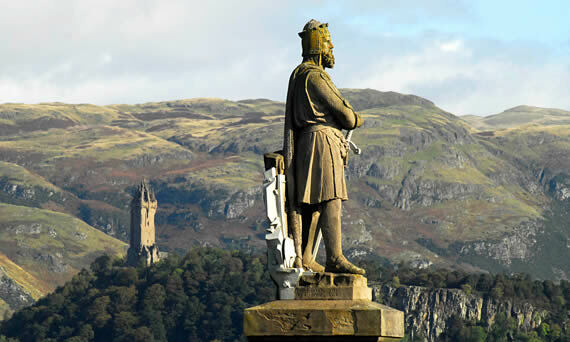 With Wallace’s mortal remains carved up and spread across the English Realm, Robert de Bruce took up the mantle – giving his internal and external enemies hell, all over the Highlands, from Buchan to Galloway. De Bruce, like Wallace before him, was often a victim of internal intrigues and diabolical disunity. Quarrels with his archrival, John Comyn and his backers, and a defeat at the hands of the English, saw de Bruce relinquish his title as Guardian, flee to the Hebrides and later Ireland. Reacting to more betrayal by his brethren led to the murder of Comyn by de Bruce, who, having regrouped, went on to hammer Edward II in the battle for Stirling Castle, in June 1314. At the Battle of Bannockburn, de Bruce pulled off the defeat of an English army led by Edward – a force that heavily outnumbered his own: some 7,000 Scots (with a mere 500 mounted) faced 17,000 English troops: 2,000 heavy cavalry and 15,000 infantryman, bristling with longbows. Victory for de Bruce at Bannockburn became his, and Scottish, legend. For Scotland, the next four centuries brought a cycle of victories and defeats, as English monarchs variously sought to beguile or crush the Scots at their whim. The last romantic hoorah echoed at the Battle of Culloden in 1746, where Bonnie Prince Charlie’s Jacobite rebellion was ground into the heather and peat, near Inverness. Through their history, in battle, the Scots were usually outnumbered, but rarely outwitted. However, the tragedy and the romance of that history was always tinged with double-dealing and betrayal. Wind the clock forward, and the same elements came to bear in the battle to keep the Highlands free of bat-chomping, bird slicing, blade-chucking, pyrotechnic,sonic-torture devices. Now, thanks to the Tories thumping election win, those North of the Border have won the prospect of respite. The question is, how Cameron’s election manifesto will play out for Highlanders? Here’s The Telegraph heralding an age of deliverance, if not outright victory. Rural communities have reacted with relief and delight after David Cameron called time on the SNP’s wind farm march across Scotland’s countryside. Anti-turbine campaigners praised the UK Government’s decision to exclude new onshore wind farms from claiming a key subsidy from April next year, 12 months earlier than expected. They said the move, which is expected to stop the construction of many developments not yet given planning permission, was a welcome respite for communities “besieged by subsidy chasers” taking advantage of the SNP’s “open door” policy. SNP ministers were furious with the decision, even claiming they may challenge it in the courts, with Nicola Sturgeon describing it as “wrong-headed”, “perverse” and “downright outrageous”. In a letter to Mr Cameron, she warned the wind farm companies may sue the taxpayer for compensation for planned schemes “rendered useless by this decision.” The industry claimed the move would cost consumers up to £3 billion. The funding for the subsidy comes from the Renewable Obligation (RO), which is funded by levies added to household bills. The Department of Energy and Climate Change (DECC) said there will be grace period for projects already with planning permission. Although energy policy is reserved to Westminster, the SNP government in Edinburgh has used its control over the planning system in Scotland to encourage the construction of thousands of turbines across the countryside. Alex Salmond, the former First Minister, set a target of generating the equivalent of all Scotland’s electricity from renewable sources by 2020, with the vast majority coming from onshore wind. Amid growing opposition from local communities, Scotland’s most senior planning officials even warned that the countryside risked becoming a “wind farm landscape”. But the Scottish Government told council planners they had set aside too little land for wind farms and Scotland now hosts more than half the UK’s onshore turbines. Graham Lang, the group’s chairman, said: “Speculative developers from across the world have flocked to Scotland because of the SNP’s open door policy to the wind industry. Scottish communities besieged by subsidy-chasers can at last look forward to some respite. Lyndsey Ward said she hoped the decision would stop the construction of 25 turbines near her home just outside of Beauly, in the Scottish Highlands. Campaigners against a plan to erect 18 410ft-tall turbines in rural Angus, above the Blackwater Reservoir, also welcomed the announcement. She also praised the UK Government plans to give communities the final say on large wind farm developments south of the Border and attacked the SNP for failing to introduce this in Scotland. But, speaking at First Minister’s Questions, Ms Sturgeon said the decision was “utterly wrong-headed” and her government would “do everything in our power” to get it changed. As with our in-a-nutshell overview of Scottish history above, it will be internal forces, disunity and betrayal that stand as the only obstacle to outright victory for the Scots. Claims by wind power outfits about suing the government, in order to ensure their ability to obtain massive subsidies until kingdom come, involve little more than the petulant rattling of Claymores. Hopeful developers are not in any contractual relationship with the government; and have little more than an expectation that government (read taxpayer and power consumer, in their guise as voters) largesse is endless and immutable. Unfortunately for wind power outfits, mere “expectations” based on policy “promises” don’t provide the soundest basis to sue for “damages”. And Nicola Sturgeon’s huffing and puffing is little more than, well, hot air. STT’s Highland operatives have previously pointed out that there is absolutely no market for any more intermittent and unreliable wind power in Scotland: that ‘market’ is saturated. The only hope for Sturgeon and her wind industry backers is to send Scottish sparks south of the Border – in huge volumes – whenever the wind is blowing. However, through quirks of history – some of which we’ve touched on – that’s an area still controlled by David Cameron. 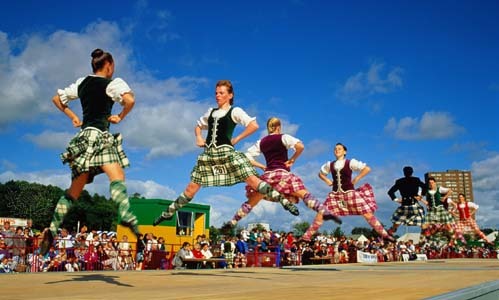 Given Cameron’s resolve, and Sturgeon’s policy and legislative impotence, STT suggests that it would be far from premature for Highlanders to don their kilts and celebrate their victory with a wee Highland fling. fighting wind turbines, not financially feasible, Return to sanity!